Banana Cue is one of the most loved street food in the Philippines. “Saba” banana is only key element of this dish. In a large wok at high flame heat cooking oil, when hot, drop the bananas and fry for about 2 minutes or until they start to slightly brown. Sprinkle the brown sugar and let it stand without stirring. When the sugar starts to caramelize, start stirring the bananas to have it coated with caramelized sugar. 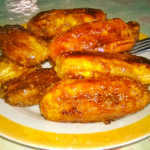 Continue frying, stirring several times to have the bananas fully coated with caramelized sugar. Turn the heat off once the bananas are cook through, do not overcook. Drain in Fry Skimmer Strainer or Colander or deep bowl with paper towel to remove excess oil. Skewer two bananas in a bamboo stick while they slightly cool down. This video shows another recipe for banana cue.